Yes, Grasshopper, ground is not always the nice stable place you think it is. Here we'll post some examples of how you can get in trouble. Check out the picture of a 110 volt ground loop in our Microwave Mortuary. Many engineers and techs don't know what a ground loop is. They must not cover it in college. And there is no "app for that". Here is an example that should be familiar to microwave engineers and techs, a power transistor is being turned on to get ready for RF test. The return leads of the two supplies are shared, for some reason someone wanted to save a piece of wire. The leads have a respectable 0.1 ohm resistance. You can draw two power supply loops on the schematic, which share the ground path; hence the term "ground loop" or "ground loops". The typical turn on procedure usually involves pinching off the device (say -4V) on the gate, then turning on the drain to full value (10 volts). Actually, you can get in trouble with oscillations doing this, we'll talk about that another day. Then the gate is slowly raised until the target current (1 amp) is seen at the drain supply. You can see at this point that the test fixture itself is now raised to ~0.1 volts, not exactly a shock hazard, but bad for a different reason. Next the DUT is connected to coax cables to a VNA. Suddenly the current raises significantly. Maybe the RF signal is placing the DUT into large signal operation? Maybe it is unstable? 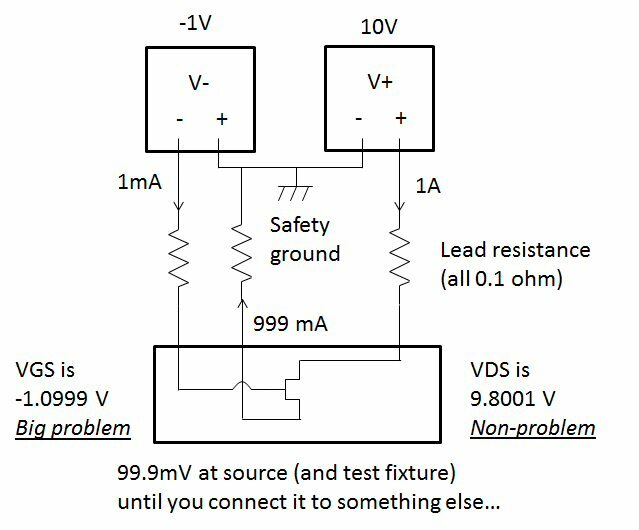 Nope, you just shifted the gate voltage by 0.1 volt, which changes the DC current; a FET is a voltage-controlled current source and here it is out of control. What about AC noise on that VNA outer jacket, as it is attached to to room's safety ground, which eventually is connected to the 220 amp circuit panel? If you did this with a pair of speakers on your home theater (or stereo if you are more than 40 years old) you'd notice an annoying hum, which would cause you to Google the problem and eventually become familiar with the term "ground loop" from Wikipedia. Try doing a phase noise measurement with ground loops and send use the results! 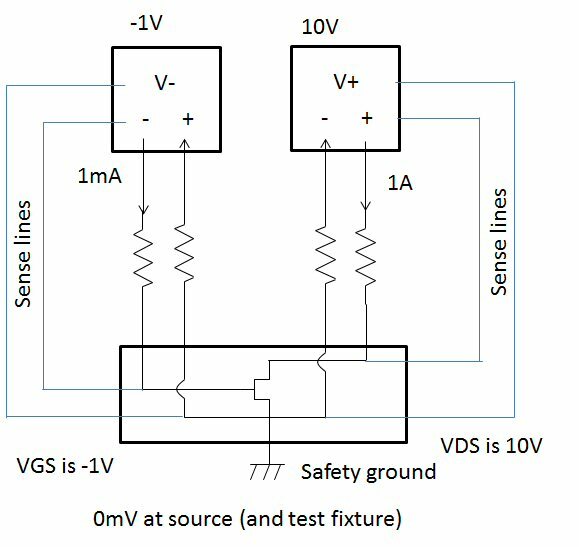 The best practice for connecting two supplies to a DUT in a test lab situation is shown below. Here all four leads from the two supplies are routed to the DUT, and the safety ground is left open at the supplies but connected at the DUT. 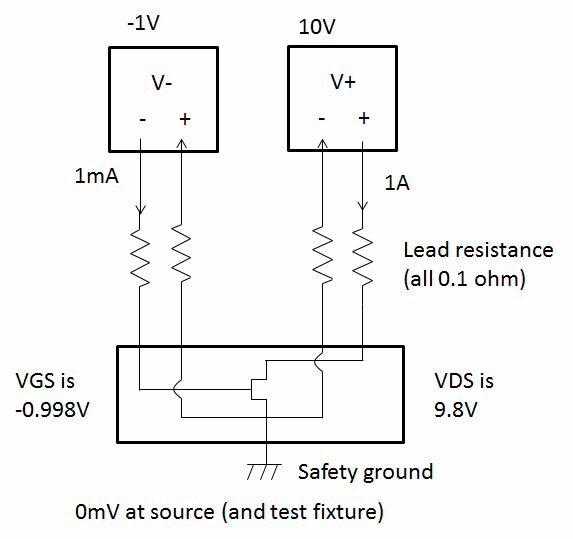 The lead resistance can be a source of minor errors, but at least the two supplies are not talking to each other, and DUT "ground" voltage will not shift when it is connected to another piece of test gear (such at the VNA). If you want to get truly fancy, you can hook up the sense lines on a power supply (you know, those connections you were told not to use...) Then the power supply will self-correct, and when you set the drain to 10 volts, the supply will compensate for test lead resistance. But be warned, there are two ways this can get you in trouble. If you connect the sense lines backwards, the supply will rail and you will blow up hardware. A competent engineer will be sent to "see what happened" and he/she is gonna recognize the situation and you'd better hope you didn't blow up their pet piece of hardware. In a worst-case situation, you blow up a column or more of amplifiers on a GaN wafer test and you get fired. A second way this can cause trouble is if a sense line becomes disconnected. 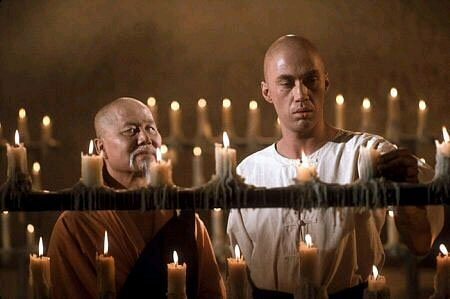 Can you guess what might happen, Grasshopper? Our advice is that sense lines should only be used on production test set-ups, and signed off by an engineer that is willing to take credit for it or blame if things go awry. This is an interesting topic, we hope to cover it soon.